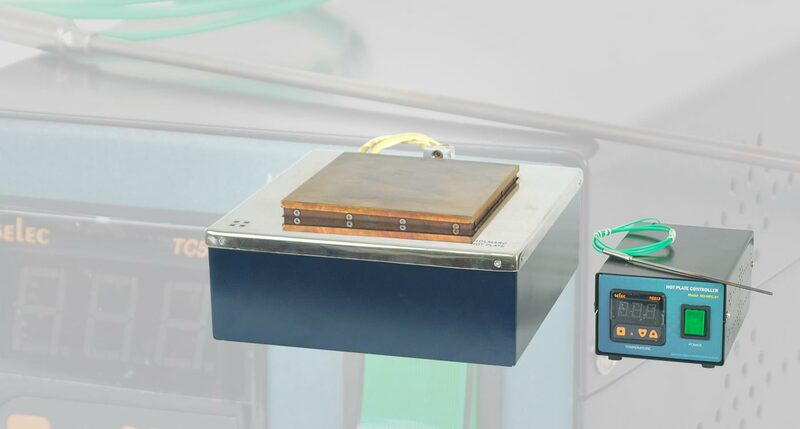 Holmarc’s HO-HPC-01, 02series hot plate is a versatile instrument equipped with high uniformity heaters controlled with an accurate digital thermostat to assure even heating across the entire surface of the hot plate. The controller, which is placed remotely (can be placed within 1.5 metre from plate) facilitates microprocessor-controlled feedback which maintains consistent, repeatable temperature settings which is ideal for repetitive procedures. The heating surface is made of high quality Stainless steel (316 L grade) which is machined smooth and flat and it contains Nichrome heating coil. The hot plate surface is resistant to spillage and corrosion. Our hot plate features an operating temperature up to 500°C from ambient with good uniformity across the plate surface. K type thermocouple temperature sensor is included in the Hot plate for accurate temperature measurements. Holmarc’s HO-HPC-01, 02 series hot plates are portable, tabletop models and areavailable in two plate dimensions: 250 x 250 mm & 150 x 150 mm. Depending on the region of use, two power options are also available for the Hotplate; 110 V & 220V AC. Hot plate find application in the field of spraypyrolysis, in electronics industry, probing, characterization inspection and failure analysis of semiconductor wafers and chips, surface annealing, metal disposition, baking and in chemical laboratories.